The Once And Future King - T.H. White - So many books, such little time. 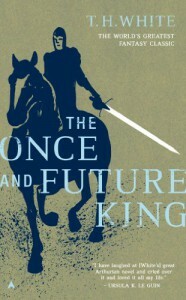 The Once And Future King consists of five books all together in one hefty read, following the adventures of King Arthur. The first book is The Sword In The Stone... Everyone knows this story even if it's only because of the 1963 Disney classic of the same title. The second book is The Witch In The Wood, this story introduces the Orkney family which plays a vital part in the future rein of King Arthur. The third, The Ill-Made Knight is all about Lancelot and his love affair with Guenever (King Arthur's wife/the Queen). The Candle In The Wind follows Arthur as an old man in the fall of his rein. In the final book, The Book Of Merlyn, Arthur meets up with the committee of animals and he lives among the ants and the geese to understand their laws of existence just like he did when he was younger.